The goal of the middle school is the further development of the independent learner who is a responsible, contributing member of society. Academic and social preparedness for high school are also emphasized. 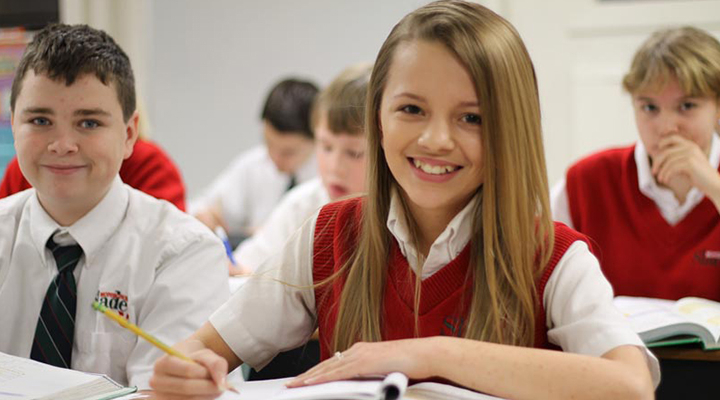 Middle school religion focuses on the study of the Mass, the history of the Church, the study of the sacraments, and the importance of prayer. Moral decision-making is discussed, and students are encouraged to engage in intense examination of their own values and behaviors to determine if they are consistent with the teachings of the Church. Language arts begins each year with a review of basic grammar. Essay and research writing skills are developed and refined. The art of public speaking, as well as the use of technology to enhance presentations, is introduced. Vocabulary development is reinforced through the study of prefixes, suffixes and roots. The critical analysis of literature is undertaken through class discussion and analytical writing. The goal of middle school mathematics is the expansion of the basic math and problem-solving skills moving toward a higher cognitive level necessary for the challenge of Pre-Algebra and Algebra I. The middle school science program, using a hands-on approach, covers General Science, Life Science, and Earth Science. The social studies curriculum focuses on World Geography, American History, and World History. Concept development, critical thinking, map skills, and verbal participation are emphasized in all subject areas. Spanish is continued in grades 6, 7 and 8. Successful completion of this Spanish program may enable Monsignor Slade graduates to enroll in Spanish II as high school freshmen. Art, music, physical education, and computer technology are offered on a weekly basis to enhance the middle school curriculum. All of our students in grades 6 - 8 have access to Chromebooks for daily use. Using their assigned Chromebook daily, students log into Google classroom during many of their classes.